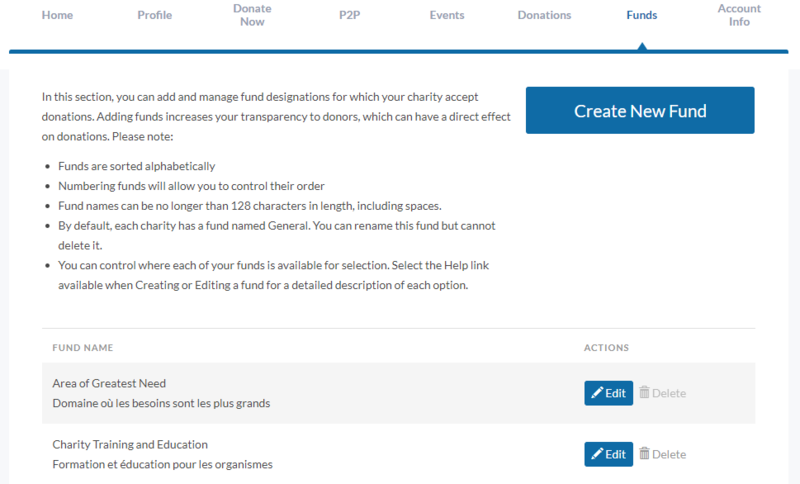 We’re excited to introduce a NEW feature on your charity’s CanadaHelps Customizable Donation Form: flexible funds management. Flexible funds management puts you in the driver’s seat by allowing control of how and which funds to display on your donation forms. You’re already able to create unlimited Customizable Donation Forms for all of your appeals. Now, you can select specific funds to connect with each donation form and order them how you like, instead of picking only one or listing them all. Use this feature to highlight your charity’s current areas of need, promote timely campaigns, target donors with tailored donation forms, or support multiple locations for your charity. 1. To start exploring our new flexible funds management feature on your donation forms, log into your charity admin account. 2. Select the “Donate Now” tab at the top. You can choose to create a new form by clicking on the “Create a New Form” button at the top-right corner. If you already have completed donation forms, scroll down the list and click “Edit” on the one you would like to manage funds on. 3. You will need to already have a list of funds created in order to set, select, and rearrange them in your donation form. If you do not have any funds yet, create new funds by clicking the “Funds” tab at the top menu bar and clicking the “Create New Fund” button. 4. 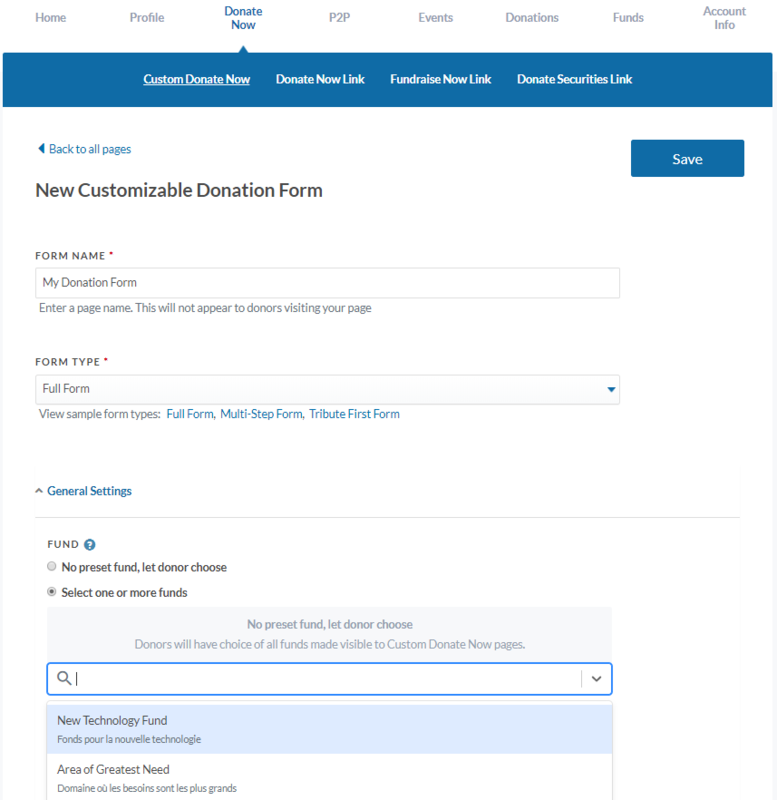 To manage funds on your donation forms, go to the “Donate Now” tab and click “Edit” next to the form in the “Custom Donate Now” section. 5. Under “General Settings” pick “Select one or more funds”. 6. Type the name of a fund into the search bar or click on the arrow to see the full list, and select which ones you would like to display in your donation form. Note: if you include “General” as one of the fund options in your list, it will be the default fund. To designate another default fund, please exclude “General” from your list”. 7. You can rearrange the display order of your funds by dragging them or clicking on the arrows on the right-hand side of each one. 8. 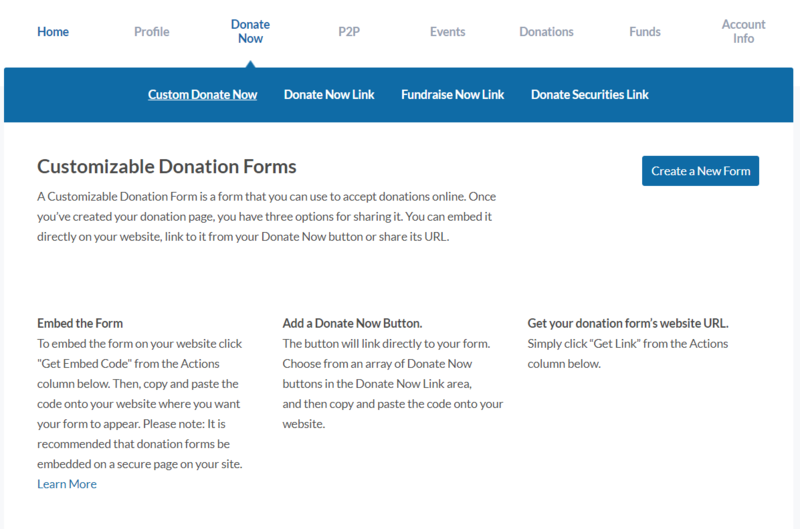 Link to your form or embed it directly on your mobile-friendly site using the embed code, which is available when you view your list of donation forms under the “Donate Now” tab and click on “< > Embed” on the right side of the selected form. Try out this new feature! Sign in or upgrade today for free to unlock the “Donate Now” option with flexible funds management.